Like the other 50,000 Duck fans at Autzen Stadium two weeks ago, we laughed and cheered. As things settled down during a TV timeout we discussed that special day in 1994 when Oregon took the first big step on their way to the Rose Bowl. Later I started thinking about some of my favorite plays of all time. I’ve talked with a few other fans since then, and it seems everyone has different favorites. I thought it would be fun to share my favorite rushing plays. When you are done reading I would love to hear about your favorites. Just scroll down until you find the comment box and share. Saladin McCullough – It seems that few people have any recollection of one of the greatest Duck rushing performances of all time. 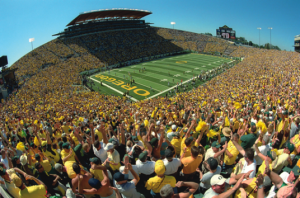 It happened on November 9, 1996, against the Arizona Wildcats in Autzen Stadium. On that day Saladin McCullough carried the ball for 223 yards on 25 carries; an average approaching 10 yards per carry. He came up short of the Duck single game record of 249, which at the time was held by Bobby Moore from a 1971 game against Utah. My favorite rushing play turned out to be McCullough’s last rushing attempt of the game. From inside the Arizona 5-yard line McCullough took a handoff on a play designed to go up the middle. The play, having been stuffed, caused him to make a violent cut to the outside. So effective was the move that a hobbled McCullough (who pulled his hamstring during the play), was still able to hop with one leg around the right side and into the end zone untouched for his 5th TD of the day. His day was finished after 3 quarters. Had McCullough not hurt himself on this play the single game rushing record would likely have fallen. Unfortunately, I’ve never seen video of this game and suspect that there was no TV coverage that day. Jeremiah Masoli – Nothing ranks higher in my mind then the 4th down scramble and run by Jeremiah Masoli in the 2009 Civil War. The winning team in that game was going to the Rose Bowl. Late in the 4th quarter, with the game on the line, Masoli was flushed out of the pocket. Rolling right, with no open receivers, he decided to tuck the ball and run. In order to get that first down he was going to have to get past All Pac-10 safety Lance Mitchell. It was a confrontation for the ages, and the collision left Mitchell sitting on the ground dazed while Masoli kept his feet and lunged past the first down marker. The first down allowed the Ducks to run out the clock. In my mind, that play most represents the point where Oregon moved into the arena of being a national power and the Beavers started a slide back to mediocrity - a double victory for the true Duck fan! So there you have it, my top rushing plays. Let us know your thoughts and memories. Scroll down below to find the comment box.